New York.- Ecumenical Patriarch Bartholomew arrived last night in New York City, the second stop from his 20 day visit to the United States. Immediately after his arrival he was expected to preside over the Great Vespers of St. Demetrios, at Greek Orthodox Parish in Merrick, NY. Today His All Holiness will preside at the Feast day Divine Liturgy at St. Demetrios Cathedral in Astoria, NY. followed by a visit of the Patriarchal Monastery of St Irene Crysovalantou. 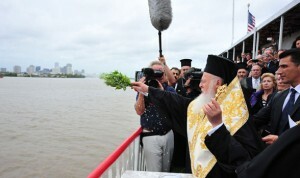 His All Holiness Ecumenical Patriarch Bartholomew blesses the waters of the Mississippi River in a special liturgical service, at the opening of the Eighth Religion, Science and the Environment (RSE) Symposium, entitled "Restoring Balance: The Great Mississippi River," in New Orleans. The Patriarchal party includes Metropolitans Athanasios of Chalcedon, Emmanuel of France, and Ambrosios of Korea etc. On the evening of the 26th, His All Holiness will preside at the 9th Annual Prayer service for the United Nations at the Archdiocesan Cathedral of the Holy Trinity. The service is sponsored jointly by the Standing Conference of the Canonical Orthodox Bishops in the Americas (SCOBA) and the Standing Conference of Oriental Orthodox Bishops in America (SCOOCH). On Tuesday, October 27th, His All Holiness will meet with the Primates of SCOBA. Patriarch Bartholomew arrived in New Orleans, on Tuesday. At the Louis Armstrong Airport along, he was received warmly by Archbishop Demetrios, Metropolitan Alexios of Atlanta, members of the local clergy, local officials, a small group of Orthodox faithful from this area and two-dozen children dressed in traditional costume. “We welcome you, Your All Holiness with deep reverence and respect, total dedication and plenty of love,” said Archbishop Demetrios of America. “From the Mother Church of Constantinople and the Holy and Great Church of Christ, the Ecumenical Patriarchate, we bring you greetings and blessings in the Name of our Lord and Savior Jesus Christ! We give thanks to Almighty God for granting us a safe arrival here in New Orleans, a place to which we return with much hope and expectation. We return after nearly four years, when we came in the Winter of 2006 to share in the loss and pain of the courageous citizens of New Orleans and to witness the devastation of Hurricane Katrina. We return to the place where the mighty Mississippi River nears its course into the Gulf of Mexico, and where the waves of the sea and the banks of the river overflowed. We return so that we might bear witness to the hope that is in you, the hope you have manifested through the rebuilding your lives and your community. We return in order to pray with you and to intercede with the Lord of creation, that the ‘flood of many waters shall not come nigh unto you again’, (cf. Psalm 31/32:6). We return to this historic and famed city, and call on your fellow citizens around the country to return here for themselves; whether to live or enjoy the unique offerings of New Orleans. Finally, we return to New Orleans with the same conviction and concern that has taken us around the globe, to oceans and seas and mighty rivers: from the Aegean to the Arctic, from the Black to the Baltic Seas, from the Danube to Amazon – and now, to the mighty Mississippi River. Throughout the previous seven Religion, Science and Environment Symposia, we have brought together academics and policy makers, scientists and theologians; so that we might pose questions and find solutions for the ecological perils of our time. Here in New Orleans, for the next five days, we shall gather again, and we thank the RSE Committee for their extraordinary efforts in bringing this conference to fruition. Our prayer is that during these days, we shall heighten awareness, strengthen resolve, raise expectations and explore new hopes. We stand in solidarity with the people of New Orleans and all people who seek a better life. And we are present with you to call for a renewed consciousness for environmental responsibility, and an awareness of what such a consciousness entails. We pray that our days among you will be a blessing for you and a blessing for us, for we come with only words of peace, love and benediction upon our lips and in our hearts. May God bless the people here present, and bestow upon all his infinite mercy”. On Tuesday, October 27th, His All Holiness will meet with the Primates of SCOBA. Later in the evening of the 27th, Fordham University will bestow an honorary doctorate in law to His All Holiness. In recognition of the Ecumenical Patriarch’s leadership in the fields of environmental responsibility, and interfaith and inter-cultural dialogue, Fordham is also presenting the initial volume of a three-part series of the major speeches of His All Holiness. Among all the festivities organized by Fordham, there will be a special opportunity for the students of the local Orthodox Christian Fellowship (OCF) to meet with and receive the blessing of the Ecumenical Patriarch. On Wednesday, Oct. 28th, His All Holiness will have meetings with U.N. Secretary General Ban Ki-moon at the United Nations, as well as with Jewish religious and lay leaders hosted by Rabbi Arthur Schneier, President of the Appeal of Conscience Foundation. His All Holiness will also travel briefly to Atlanta, and celebrate an Ecumenical Doxology in the Annunciation Cathedral of the Metropolis. Following his return to New York City on Friday, Oct. 30th, he will attend a reception at the Museum of Biblical Art (MOBIA), which will be presenting a month-long (mid-October to mid November) exhibition in honor of His All Holiness and his environmental initiatives. To commemorate the upcoming U.S. visit of the spiritual leader of the worldwide Orthodox Christian Church, the American Bible Society will display an exhibition of sacred texts and icons celebrating the history of the Orthodox Christian faith tradition at the Museum of Biblical Art (MOBiA), beginning on Oct. 30 and continuing through Jan. 24, 2010. For more than seven years, the American Bible Society has worked alongside the Orthodox Church, publishing Bible literature consistent with its faith and doctrine, including: Today’s Greek Bible with Deuterocanonicals & Apocrypha and The Orthodox Study Bible: New Testament and Psalms New King James Version. Honoring His All Holiness Ecumenical Patriarch Bartholomew’s concern for the environment, the exhibit will feature icons, volumes of sacred Scripture, a liturgical Psalter, maps and rare architectural portraits of Constantinople. The exhibit will also highlight the cultural legacy of the Orthodox Christian Church, as well as a photo and video display of the Ecumenical Patriarch’s environmental work. Headquartered in New York City, the mission of the 193-year-old American Bible Society is to make the Bible available to every person in a language and format each can understand and afford, so that all people may experience its life-changing message. The Museum of Biblical Art (MOBiA) celebrates and interprets art related to the Bible and its cultural legacy in Jewish and Christian traditions through exhibitions, education and scholarship. 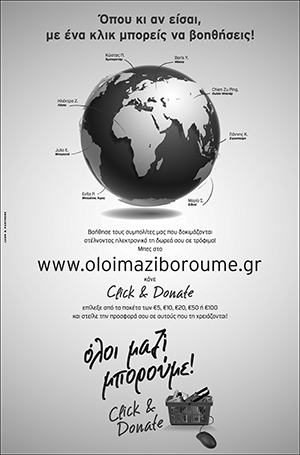 On the evening of October 30th, His All Holiness will attend a gala musical celebration at the famed Alice Tully Hall in New York, both in honor of his presence in the United States and in tribute to the decade of service of Archbishop Demetrios. Maestro Peter Tiboris will lead the Manhattan Philharmonic in a program and a special appearance by the Archdiocesan Metropolitan Youth Choir. On Saturday, Oct. 31st, His All Holiness will address the Archdiocesan Council and meet with the National Board of Philoptochos. In the evening of the 31st, the Order of Saint Andrew, Archons of the Ecumenical Patriarchate will present their annual banquet in honor of the Ecumenical Patriarch. A special speaker for the evening will be the newly enthroned Roman Catholic Archbishop of New York, His Excellency Timothy Dolan. On Sunday, November 1st, His All Holiness will preside at a Patriarchal Divine Liturgy with Archbishop Demetrios and all the Members of the Holy Eparchial Synod of the Greek Orthodox Archdiocese of America at the Archdiocesan Cathedral of the Holy Trinity in New York City. In a rarely seen occasion, he will personally conduct the investiture of the new Archons of the Order of St. Andrew the Apostle. In the evening of November 1st, the Patriarchal Delegation leaves for Washington DC. While in the DC Metro Area, His All Holiness will mark his 18th year as Ecumenical Patriarch in a Doxology service at the Sts. Constantine and Helen Church in Annapolis, MD .